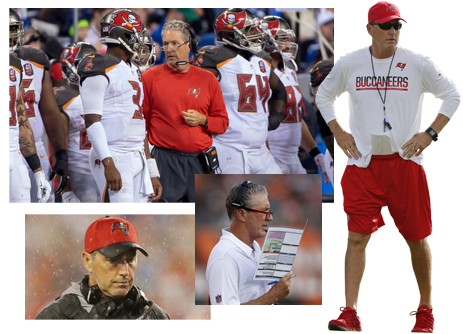 Dirk Jeffrey Koetter Head Coach of Tampa Bay Buccaneers 2016 to 2018 - Coach Koetter's three-years of steering the Pewter Pitate ship hit shallow waters and ended after the season-ending loss to the Falcons in Raymond James stadium. After another 5-11 season, the Buccaneers fired Koetter the same day, December 30th, 2018 - BUCS Coaching History 1976-Present. 11th Head Coach of the Buccaneers, Captain of Ship for last 3 Seasons. College..... Idaho State University 1981 BA 1982 Masters Athletic Admin. Koetter is an American football coach who is currently the head coach of the Tampa Bay Buccaneers of the National Football League (NFL). He was the head coach at Boise State University from 1998 to 2000 and at Arizona State University from 2001 to 2006, compiling a career college football record of 66–44 (.600). Koetter was also the offensive coordinator for the Jacksonville Jaguars, Atlanta Falcons, and Buccaneers. 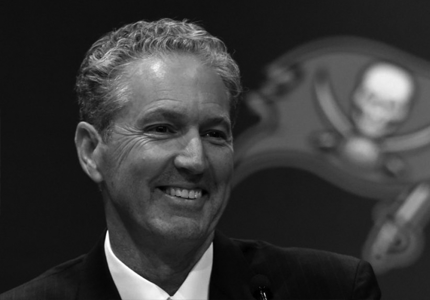 Koetter grew up in Pocatello, Idaho, the son of a football coach. A quarterback, Koetter was born Dirk Jeffrey Koetter to Barbara and Jim Koetter, also a football coach, on the 5th of February 1959 growing up in Pocatello, Idaho where he was raised. Koetter later graduated with a bachelor’s degree in 1981, returning to college immediately and received a master’s degree in Athletic Administration in 1982, and by the following year, he started his coaching career at his alma mater. He held the position of head coach at Highland High School for two years before taking the role of offensive coordinator at San Francisco State University in 1985. Dirk Koetter held that position for a year before becoming something of a journeyman, taking the offensive coordinator job first at the University of El Paso from 1986 to 1988, then at the University of Missouri from 1989 to 1993. After Missouri, Koetter joined Boston College from 1994 to 1995 before moving to the University of Oregon from 1996 to 1997. In 1998 and for the first time since his coaching career kicked off, Koetter who was big on accomplishment and experience by then was appointed as head coach of Boise State University. He held that position from 1998 to 2000 before moving to Arizona State where for the first time in a long time, he and his family found some stability as he held the position from 2001 to 2006. Koetter has been married for three decades. He was introduced to his wife, Kimberly Ann Koetter, by former Idaho State linebacker coach Marvin Lewis, in the 1980s, while he was coaching at Highland High School. Kim, as she is fondly called by her peers, was at the time a volleyball player at Idaho State. The two eventually exchanged vows at a small ceremony sometime in 1988, where their matchmakers’ daughter served as the flower girl. Together, the couple has four children; two boys Derek and Davis, and two girls Kendra and Kaylee Koetter. Due to his job, the couple has lived in various cities across the country. The three older kids are however living away from home now, leaving the couple with their youngest child, Davis, who will soon be heading to Portland State University to play as a quarterback. Davis is not the only Koetter child looking to sports for a career. His daughter, Kaylee, was a star volleyball player for the Tampa women’s volleyball team. Following a career-ending injury, Kaylee took the job of assistant coach for the team. She spent two years there before leaving the position for that of head coach of the University of Illinois at Chicago. The second Koetter child making a living in and around sports is Derek, who currently holds the position of Assistant Athletic Communications Director for the University of Tampa. The third is Kendra, who is currently a volleyball player at the University of North Carolina. The highest paid coaches in the NFL earn around $8 million annually. Even though Dirk Koetter’s salary has not been revealed to the public, the Buccaneers head coach, who agreed to a five-year deal when he took the position on January 02, 2016 following the firing of Lovie Smith, definitely has a long way to go before he is able to rake in such huge amounts to rank among coaches like Pete Carroll, Bill Belichick, and Sean Payton. Koetter attended Highland High School where he played football and was the star quarterback of the team. After graduating with a master’s degree in Athletic Administration in 1982, Koetter did not become a professional foot player. It is not clear if he intentionally chose to not enter the NFL or if he was not good enough to be picked up by any team. Koetter, however, by the following year, started his coaching career at his alma mater. Koetter was the head coach at Highland High School for two seasons (1983, 1984), then became a full-time college assistant coach in 1985 as the offensive coordinator at San Francisco State University. After his time at San Francisco State, he coached at UTEP (1986–1988), Missouri (1989–1993), Boston College (1994–1995), and Oregon (1996–1997). Koetter was the head coach for three seasons at Boise State from 1998 to 2000, then moved to Arizona State in 2001. His record with the Broncos was 26–10 (.722), with two Big West Conference titles and two bowl victories and was named Big West Coach of the Year twice. At Arizona State, Koetter compiled a 40–34 (.541) record, and four Bowl appearances in six years. Under Koetter, who was also the offensive play caller, the Sun Devils became known for a vertical passing attack. On November 26, 2006, The Arizona Republic reported that Koetter was being terminated as Arizona State football coach. His final game was the 2006 Hawaii Bowl on Christmas Eve, a 41–24 loss. In 2007, Koetter accepted the position of offensive coordinator for the Jacksonville Jaguars of the National Football League (NFL). In his first year in the NFL, he had immediate success setting franchise records for total points scored and yards gained while helping the Jaguars to an 11–5 record. In his five seasons with the Jaguars, the team cumulatively ranked third in the NFL in rushing yards over that time span in addition to having the NFL's leading rusher in Maurice Jones-Drew in 2010. On January 15, 2012, Koetter was hired as the offensive coordinator for the Atlanta Falcons. On January 2, 2013, the Falcons signed Koetter to a contract extension that ran through the 2014 season. After two years in Atlanta, Koetter was hired by the Tampa Bay Buccaneers to become their offensive coordinator in 2015. He held the position of offensive coordinator for a year before finally getting the nod to become head coach following the firing of his boss Lovie Smith, Koetter was hired on January 15, 2016 as the head coach. After posting a 9-7 record in 2016 and barely missing the playoffs, the Buccaneers had high expectations for the 2017 campaign. However, Koetter and the Buccaneers failed to meet those expectations, slipping to a 5-11 record. Despite regressing in his second year as the Buccaneers coach, on December 29, 2017, the Buccaneers announced they would retain Koetter for the 2018 season.